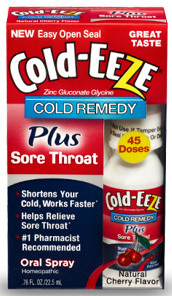 Cold-EEZE® Sore Throat Oral Spray - Natural Cherry Flavor 0.76 oz - Penn Herb Co. Ltd.
Cold-EEZE® Oral Spray Plus Sore Throat shortens your cold, works faster, and helps relieve sore throat. Does not cause drowsiness or light headedness. Does not affect blood pressure. To reduce the duration of the common cold; reduces the severity of cold symptoms: cough, sore throat, hoarseness, nasal congestion and/or post nasal drip. Adults na d Children 12 years and over: Spray 2 times in mouth at the onset of symptoms on inside of cheeks, roof of mouth and gums. Up to 12 sprays (6 doses) per day. SEE PDF LABEL FACTS FOR ADDITIONAL DIRECTIONS AND WARNINGS.